Conferences often pride themselves on attracting great speakers, and a good speaker line-up helps sell the tickets for a conference. “Big-name” speakers can boost ticket sales: but it’s also necessary to help introduce new speakers to an audience, giving each new generation of developers the opportunity to become the “big names” of tomorrow. And it’s important to have a diverse speaker line-up if you want a diverse attendance, because people looking to buy tickets aren’t just looking at the line-up for the names of known subject matter experts, or at the schedule of talk topics; they’re also looking for role models, similar to themselves. Conferences with a more diverse speaker line-up will attract a more diverse attendance. 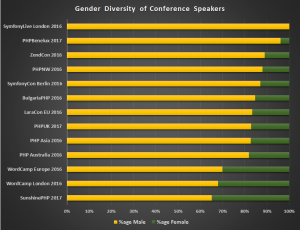 I looked at the speaker line-up for a few PHP and related conferences from the last year, and some of the schedules that have already been announced for the current year, and did a highly simplistic break-down of the speakers by male/female gender. It might be an over-simplistic approach, and doesn’t really cover all the different aspects and shades of diversity; but looking at the pictures on the speakers page is how some people will assess whether or not to attend a conference. This is an over-simplistic assessment, because gender isn’t the only aspect of an inclusive line-up; but it does reflect a deeper reality: looking at the actual speaker line-ups of these conferences, those that show a better male/female diversity also display a better diversity in many other regards as well. And it shows that some conference are more able to attract a wider range of speakers than others (I’d love to know Adam Culp’s secret with SunshinePHP; and really wish that I was able to attend). The danger of a less-diverse speaker line-up is that it becomes self-fulfilling: when the following year’s Call for Proposals goes out, there will be potential speakers who will look at the previous years line-up, and wonder if it is worth their time and effort to submit. I’ve never organised a conference, but I can imagine some of the problems. It isn’t simply a case of ensuring that the speaker-line up is diverse, but starts with ensuring that you get a good response to the Call for Papers from a diverse range of potential speakers in the first place. As I’ve been writing this article, I saw this quote from Kelsey Hightower on twitter: “Some suggest a blind CFP review process. I can’t see how that works unless your CFP attracts a balanced set of submissions from all groups.” That’s just one quote from a thread worth reading. In 2012, JSConf EU was trying to improve the gender balance in their speakers and used a blind selection process to choose talks from their CfP, but found that it didn’t achieve their objectives; so they took an alternative approache and blogged about their experience and solution. The Lead Developer Conference is relatively new, but right from their very first conference, they pro-actively set out to create a diverse speaker line-up. Meri Williams blogged about how they have approached this, and her post is worth reading. The Cucumber Cukeup organisers have done a podcast about promoting conference diversity; again, some interesting thoughts and ideas for conference organisers. So there’s a few thoughts. If a conference wants to attract a more diverse attendance, then they need to ensure that they have a broad diversity of speakers. They need to pro-actively seek out potential speakers from the broader community, and persuade them to submit. They should make their initial assessment of proposals based on merit, but can make deliberate choices to reduce the short-list to select their final line-up. A diverse speaker line-up isn’t the only step needed to attract a more diverse attendance to a conference, but it will help; and I’ll be posting some other suggestions that conference organisers may take in a future post. This entry was posted in Diversity and tagged Conference, Diversity, PHP, Speakers. Bookmark the permalink.